The web runs on content. I don't have to tell you that or convince you of that fact. That means if you want to find your audience and cultivate a relationship with them, you have to have plenty of content out there, both on your site and on other spaces on the web (think social media, guest blog posts, articles on authority sites, YouTube videos etc.). That's more than most of us can write on a regular basis which is why it's important to have a conversation about why you should buy content for your website, and how to go about doing that. In addition to sharing a lot of interesting content, that content needs to fulfill a purpose for your business and your overall marketing strategy. Doing this right can go a long way towards reaching out to the right people who are interested in what you do and what you have to offer. That's how you build a sustainable business that will continue to grow and flourish. In other words, you want to create content that serves a purpose. It's called content marketing and the basic idea is to share tips, ideas, suggestions, helpful hints and the likes that the people you are trying to reach are looking for. That means you need to have a pretty good understanding of who your target market is and what they want and need. With that information in hand, you can come up with content ideas that will get them into your funnel. A good key principle to keep in mind is to come up with content that's useful, but either incomplete, or something that leads them into your lead magnet offer or paid product. Think about what your audience needs to know where the next logical step is to check out your product. This blog post is a great example of this content marketing principle at work. Our target audience (you) is website owners who market with content. Their problem is finding the time to get all the writing done and figuring out a way to leverage content marketing without being the bottle neck because there is only so much writing they can do. We're educating about content marketing and why you should buy content for your website. Which is why we'll introduce you to the concept of pre-written content next. There are a lot of pieces and parts to building a successful online business. If you're stuck trying to write 3 to 5 good blog posts on a weekly basis AND you aren't able to get to the part where you're promoting your content OR marketing your website in general OR one of the million other little things that need to be done then something needs to give. If you're not finding the time to work on that new product or building relationships with other bloggers for example, it may be time to look into pre-written content. Think of it as a short cut. It's a way to get those blog posts out there working for you without having to put in the time at your desk to write them. It's also a great tool to give you leverage. Let's say you only have time for one good blog post per week with everything else you need to do. That limits your growth and your reach. If you can pick up some quality pre-written content and use it to get two or three good blog posts per week out there, you'll grow that much faster. It saves you time and also helps with ideas for other pieces of content you can share. Speaking of sharing. Having these fresh blog posts out there also gives you something new to share on social media, and in your emails. In short, it gives you content that you can use to nourish the relationship you're building with your audience. 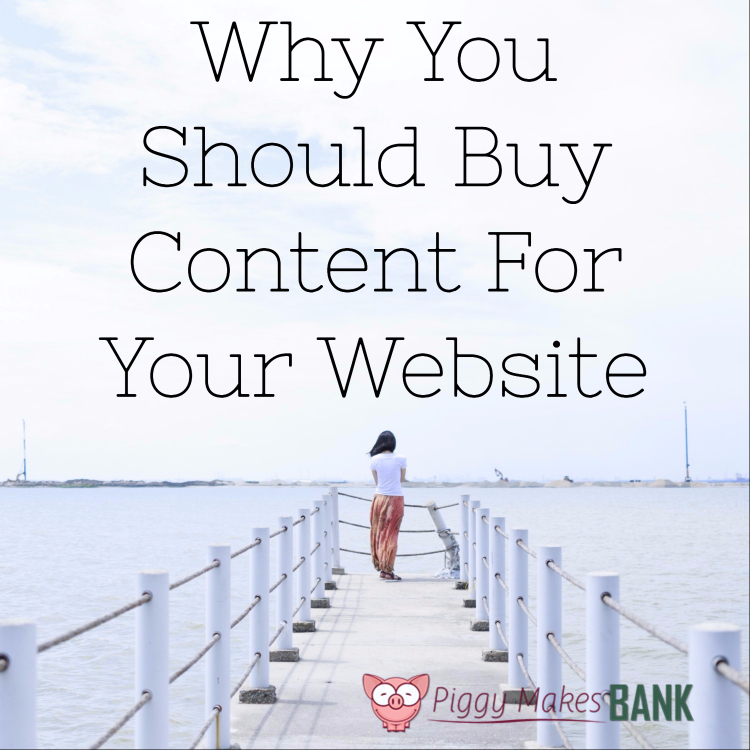 Buying content for your website can be a smart business move but how do you go about purchasing these articles, blog posts and more? There are two basic options. Let me run you through both of them so you can decide what's best for you and your business right now. By the way, the two aren't mutually exclusive. You could use them both to flesh out your content marketing strategy. Your first option is to hire someone to write the content for you. Think of it like a ghost writer. There are plenty of good people out there who will gladly write exclusive content for you. The big problem is that it's expensive and finding a reliable writer who writes the content you need for your blog can be hard to find. You know yourself that it's a lot of work and takes time to put together a well thought out article. That being said, it's doable and there's certainly a time and place for this. For most of us though, pre-written content bundles that you (along with other people) can buy and tweak for your needs are a much more affordable and better option. Let's take a look at those. PLR content is pre-written content that's sold to multiple users. You take the content and then make it work for you. PLR articles are usually written in a fairly neutral voice and the content is somewhat general. For example, you could get a PLR pack on the benefits of walking. If your website is for new moms you're not going to find pre-written content with this audience in mind. Instead, you'd get the bundle, and then go through it and edit it to reflect and speak to your audience. When the article talks about working in a 15 minute walk on your lunch break or after dinner, you may want to choose to change that to putting the baby in the stroller to nap and going for a walk during that time. Even with original, ghost written content, you're going to do some editing to make it fit for your site, your audience, and reflect your voice. You'll do a little more of that with PLR content, but you're also paying a lot less. That, in the end, will give you a much better return on your investment (ROI) while still leaving you with plenty of time to work on everything else on your never-ending to-do list. There's another hidden benefit to using PLR content instead of hiring a writer to work up original content for your site. PLR content creators like me and Tracy here at Piggy Makes Bank put a lot of work into choosing the topics for our packs. We are business owners and to make this work, we have to pick winners. We have to put in the research and gain the experience to come up with topic ideas that will be popular with website owners, but more importantly their audiences. Without that, we wouln't have a lot of repeat business. In short, PLR owners know their stuff and are pretty good at picking hot topics that your audience will love with minimal tweaking and editing on your part. Plus, you don't have to come up with the idea and article outlines like you would for a writer. Ready to give this idea to “buy” content for your website a try? We have some free PLR you can play around with before you start to actually pay for pre-written content. (Of course we have plenty of that as well).